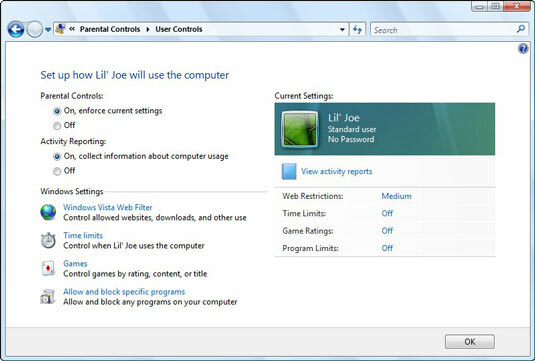 1Open the Control Panel from the Start menu and choose Parental Controls in the User Accounts and Family Safety section. If Vista’s built-in policeman says, A program needs your permission to continue, feel free to click the Continue button. 2Click the user account you want to restrict. Vista only lets you add parental controls to one user account at a time. When you choose a user account, the Parental Controls screen appears. The next steps take you through each section of the controls. 3Turn the parental controls on or off. The Parental Controls area first presents two switches, letting you turn monitoring on or off: Parental Controls and Activity Reporting. 4Set the Windows Vista Web Filter to determine what parts of the Web your child may visit. The Web Filter lets you choose the parts of the Internet your child may view. To block some Web sites, click Edit the Allow and Block List. There, you can punish your child by keeping her off of MySpace.com for one week, for example. For ultimate control, block every Web site by clicking the Only Allow Websites Which Are on the Allow List box, and then adding a few safe sites to the allowed list. 5Choose whether to allow file downloads and then click OK. The final box at this page’s bottom lets you stop your child from downloading files, an easy way to keep them from downloading and installing programs without your knowledge. However, checking this box may also keep him from downloading files needed for schoolwork. 6Add restrictions on time limits, games, and specific programs and then set activity reports, clicking OK after each. This huge category lets you block specific things on your PC rather than the Internet. 7Click OK to exit parental controls. Your computer is now set to allow or forbid the various activities that you addressed in Parental Controls.